Gordon served served with the 78th Fighter Squadron in Hawaii flying a number of fighter aircraft including P-40s and P-47. He was shipped out to Iwo Jima with the 78th with their P-51D Mustangs. For the first few days after arriving, they flew air to ground support at Iwo for the US Marines. In April 0f 45 as B-29 they began very long range (VLR) fighter sweeps over Japan and as escorts on bombing missions to mainland Japan. The 78th was the first land based fighter squadron to fly combat missions over mainland Japan. The account of Gordon's last mission and being forced to ditch on the 4th of July 1945 is linked here. Gordon later served as a F-86 Sabre pilot in the Korean war. His third and final war was Viet Nam where he was a squadron Commander of F-4 Phantoms, and later Deputy of Operations of a Fighter Wing flying missions north to Hanoi from Viet Nam and Thailand. He retired from the USAF in 1972 as a Colonel. He attended a 78th FS reunion in Hawaii from 2-8 Dec 2006. 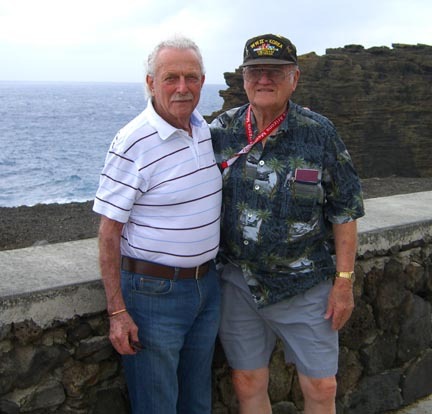 Former 78th FS Squadron Mates Jerry Yellin and Gordon Scott at the Halona "Blow Hole" on Oahu in Dec 2006. They hadn't seen one another since a combat mission briefing over 61 years ago on Iwo Jima when Gordon was blown out of the sky over Japan and had to ditch his P-51 in a lake. Jerry published his book "Of War and Weddings, A Legacy of Two Fathers" in 1995. It is available at amazon.com.